We believe that self-confidence and self-discipline are valuable aspects of our lives. On the physical side, the efficiency of our various exercise programs are excellent for providing weight loss and/or control, and for cultivating strong and flexible forms thus promoting good health. All of our classes, group and private, are taught by highly qualified Black Belt Instructors, whose training and ability are constantly being upgraded by the world renowned Frederick J. Villari, Grandmaster, and 10th Degree Black Belt. One of the greatest Grand Masters in the world today, Fred Villari instructs karate masters from around the world who seek to discover the secrets behind his unbeatable fighting system. Listed in the Guinness Book of World Records, Grandmaster Villari holds the world’s record for the fastest punch, surpassing even Bruce Lee by throwing an amazing eighteen punches per second! $1000/ 5 months + 1 month free + free uniform.$ 200/ month + free uniform (8 sessions). $ 1350/ 12 months + free uniform. 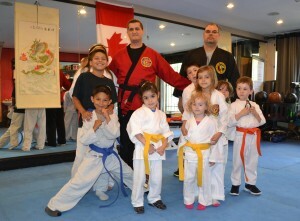 Inquire Terry about his Martial Arts classes today by calling (416) 880-2047 or emailing tpopkf@hotmail.com. We are looking forward to fulfilling your exercise needs! Classes are held on Wednesdays, Thursdays, Friday, and Saturday nights. Sessions are available to individuals of all levels and ages. Grand Master Terry Popovich assess your level and works your way up from there. A free uniform will be provided if needed.